Falling commodity prices have hurt Freeport McMoRan Inc, but if commodities rise the upside potential is tremendous. 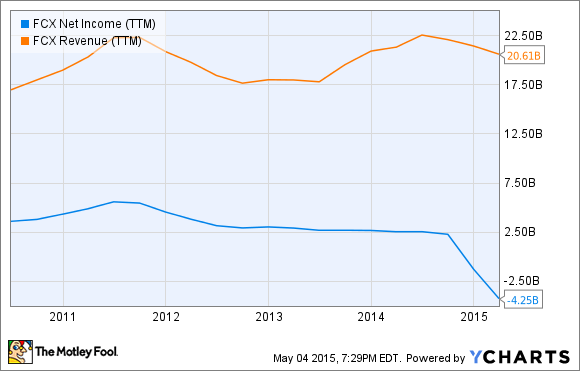 Not a lot has gone right for Freeport-McMoRan Inc (NYSE:FCX) in the last five years. Copper prices have plunged, a push into oil & gas came at precisely the wrong time, and now financial results are starting to show how bad things have gotten. Loss ballooned to $2.5 billion, or $2.38 per share, in the first quarter on $2.4 billion in charges related to the energy business, and unless commodity prices improve the losses will continue. Management gave some insight into what has to improve and how it will be adjusting strategy on a recent conference call with analysts. Here are the highlights. The biggest concern for copper miners in 2015 was that the market would be dramatically oversupplied, leading to a further decline in prices. Management said that supplies haven't been as big a deal as feared, in part because expansion projects have been delayed. We'll see if that leads to improving prices and profits later in the year, which is the hope. With this, Adkerson was showing just how much upside Freeport McMoRan has if copper rises. In the previous quote he indicated that the market isn't as oversupplied as it could be, and that could lead to higher prices -- and here he's giving the upside for investors. When deciding whether to buy or sell shares of Freeport McMoRan, it's important to keep in mind that commodity prices will do a lot more to impact earnings than anything management could do. It's just part of being in the mining and extraction business. The huge drop in oil prices came at exactly the wrong time for Freeport-McMoRan, which is now looking to fund the business with a potential spinoff. That would be ironic, since the oil & gas business is the result of the acquisition of McMoRan Exploration and Plains Exploration in 2013, and the former was spun off from Freeport-McMoRan in the 1990s. There's really very little synergy between oil & gas mining and metals mining, so it's no wonder the spinoff could happen once again. The energy business may not be as successful as Freeport-McMoRan thought it would be, but that doesn't mean management won't bet on its growth. The challenge is figuring out whether or not that growth will be profitable. That's a long explanation of what it will take for the energy business to make money, but it shows what a slippery slope Freeport-McMoRan and other U.S. drillers are on. Today, Brent crude is trading for just over $66 per barrel and WTI crude is nearly $59 per barrel, meaning the business should be profitable. But we've seen in recent months that oil prices can drop dramatically, and when they do the energy business can get in big trouble quickly. Across the board, Freeport-McMoRan needs to see higher commodity prices to live up to its $27 billion equity valuation, and a generally weak global economy doesn't bode well for price trends. I would be cautious jumping into this stock right now given the macro environment. While it may seem like a tempting and leveraged bet on the return of commodities, the risk if commodities don't rise is continued multi-billion dollar losses, which could cripple a company with over $20 billion in debt.